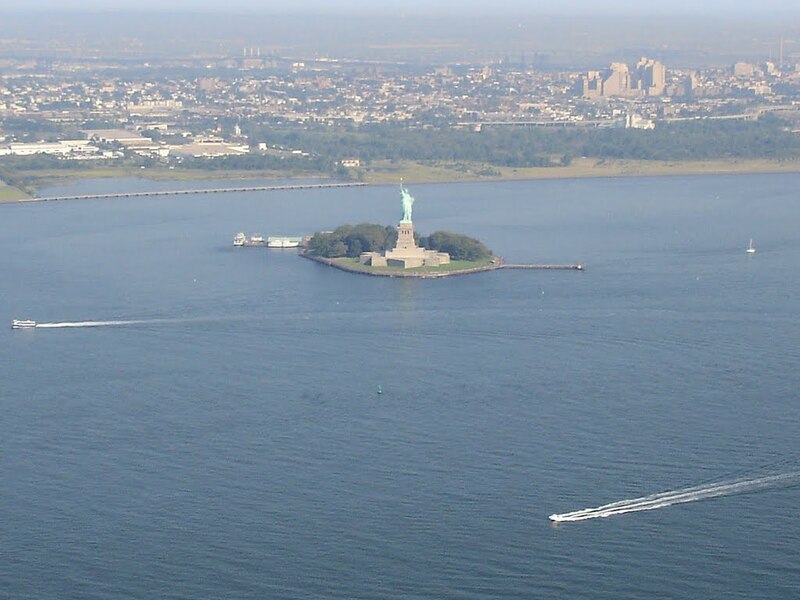 June 2004, New York, NY: I stood on the deck of the Intrepid moored in the Hudson River. Above the World War II aircraft carrier, a steady stream of fixed and rotary wing aircraft passed back and forth along the river at relatively low altitude. This was my first exposure to the Hudson River VFR Corridor; a virtual tunnel bored directly through the complex superposition of Class Bravo (i.e. really busy) airspaces surrounding Newark, La Guardia, and JFK. 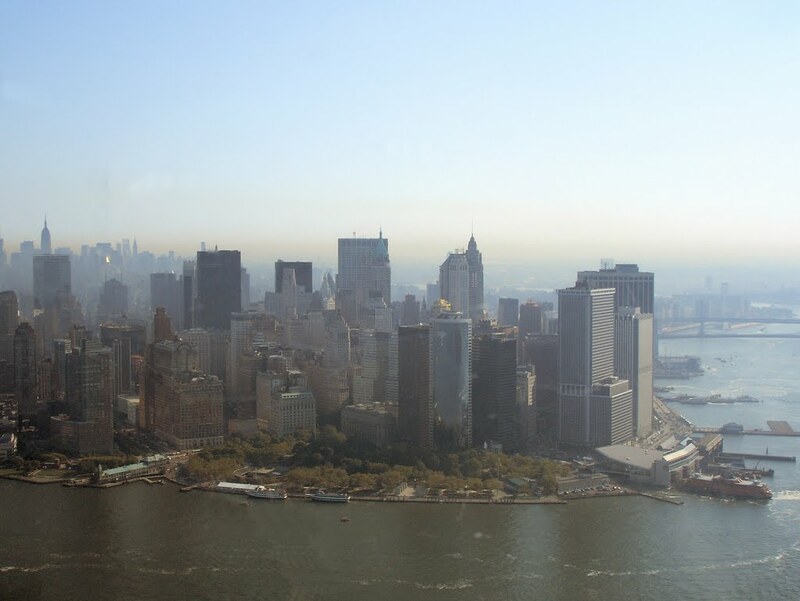 The corridor provides free passage to aircraft transiting the busy New York City terminal area without forcing them to contact air traffic control. After all, those controllers are busy juggling heavies queued up for the limited runway real estate available in the New York City area. 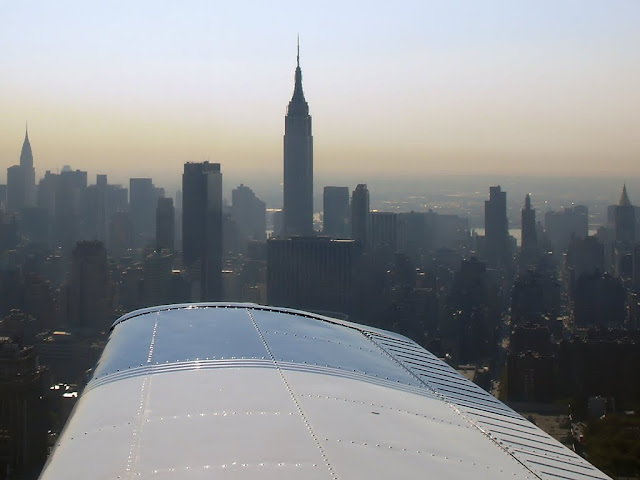 As I watched the light aircraft flying along the river, I envied them their magnificent view of the city and hoped that someday I might have an opportunity to fly the corridor. August 17, 2008: Kristy, the Bear and I took wing to visit our friends Brent and Jackie in New Jersey. Warrior 481 spent the night at Somerset Airport (SMQ), a bustling general aviation airport west of Newark that became the 80th airport I landed at as pilot in command. Being so close to New York City, it struck me as an excellent home base for an excursion down the Hudson River Corridor. There is a lot of information available concerning the corridor and I won't bother trying to repeat it here. The basic rules are simple. Aircraft self-announce their positions on the designated frequency as though flying into a non-towered airport. While the ceiling of the corridor is an imaginary deck at 1100 feet, the floor and walls are defined by the river itself. 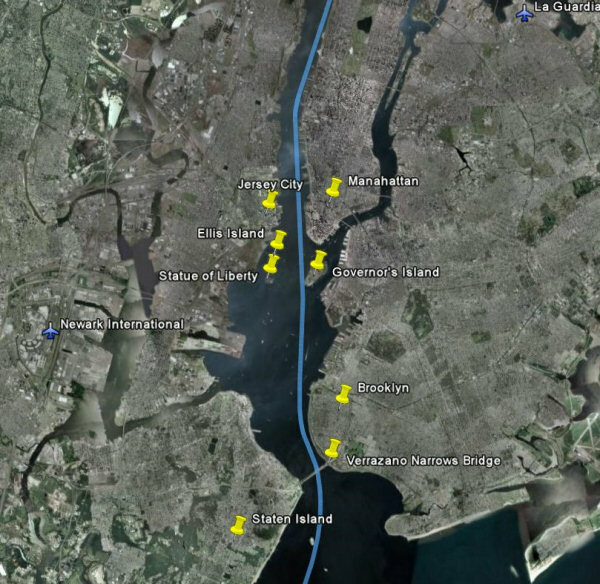 This is what the corridor looks like on the New York Terminal Area Chart. Within the morass of overlapping airspace, the corridor is visible as regions with a floor of 1100 feet that VFR pilots must remain below unless specifically cleared into the Class Bravo space overhead. The red trace represents my actual flight path through the corridor as logged by my GPS and superimposed using Google Earth. I wanted to make the trip in the early evening, when the setting sun would provide ideal lighting of the skyline for photographs. But the Yankees had a game scheduled that afternoon, thus creating a temporary flight restriction on the northern end of the corridor. And who wants to mess around with one of those? This is how I found myself departing Somerset airport on Monday morning at 9:00. Being the only one in my family who can swim, I made an executive decision to fly alone. My route took me southeast below Newark's Bravo airspace, across Raritan Bay, and over the Verrazano Narrows Bridge that links Staten Island to Brooklyn. Once in the corridor, I continued north past Manhattan to the Tappan Zee Bridge before returning to Somerset. I took a few pictures along the way, but was rather busy keeping track of my position and altitude lest I wander into Bravo airspace without permission or, worse, into another aircraft; Manhattan is surrounded by a nimbus of helicopters that circle the city like gnats. 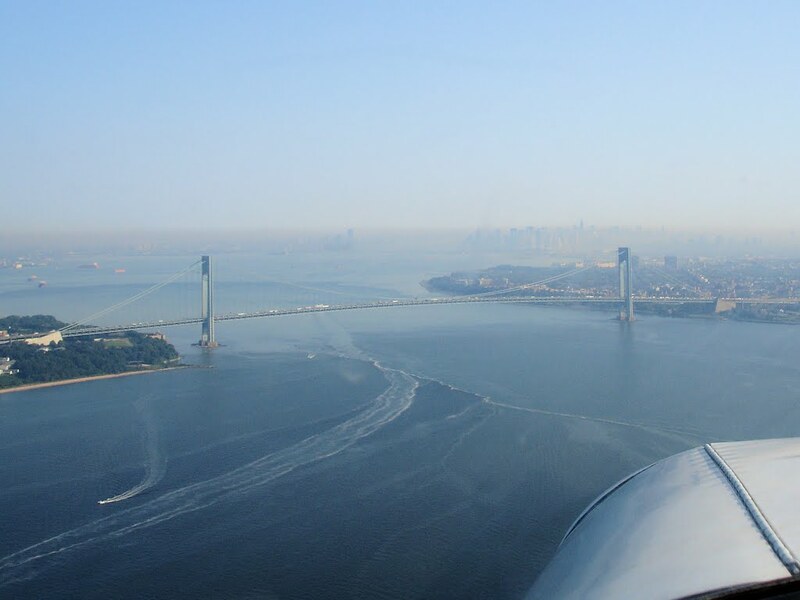 Over Raritan Bay, approaching the Hudson River Corridor via the Verrazano Narrows Bridge. 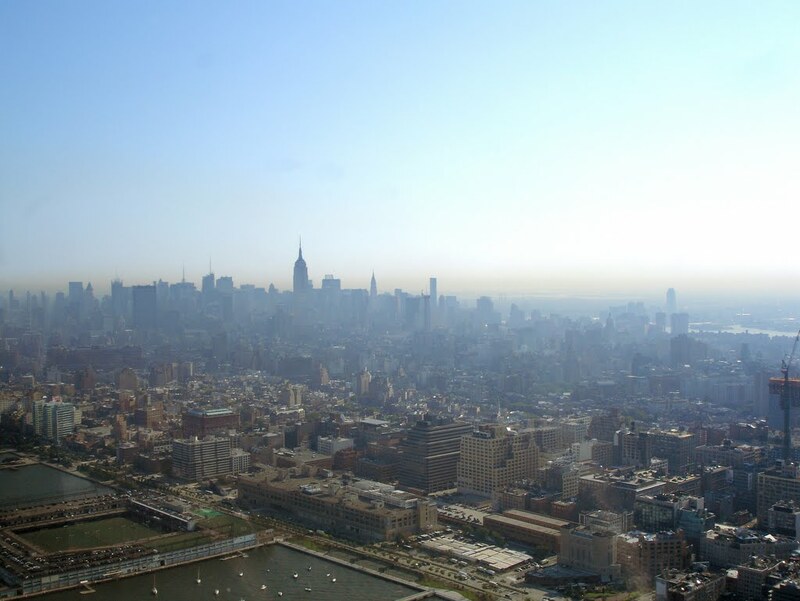 Manhattan is visible in the distance with only the tallest buildings poking up above the haze. The ceiling of the Hudson River Corridor is 1100' above sea level and I maintained 900' for the entire trip. The Hudson River Corridor operates much like a road - opposite traffic keeps to the right. My northbound track meant that I was on the wrong side of the corridor to get close to the Statue of Liberty. But it was amazing to see her highlighted by the rising sun. Ellis Island, just north of the Statue of Liberty. Lower Manhattan. The lighting made me wish that I had been able to make this flight in the evening, but it was nevertheless an awesome sight. From street level, it seems as though the concrete and steel canyons of New York City must go on forever. 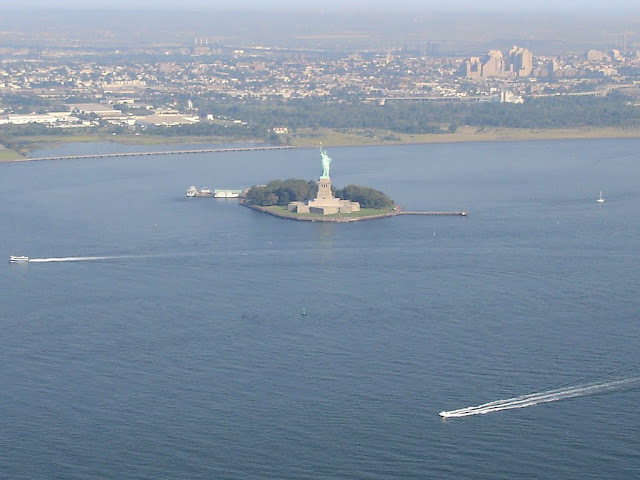 Strangely enough, from 900' over the Hudson River, I was overcome by the same impression. This is a huge city. 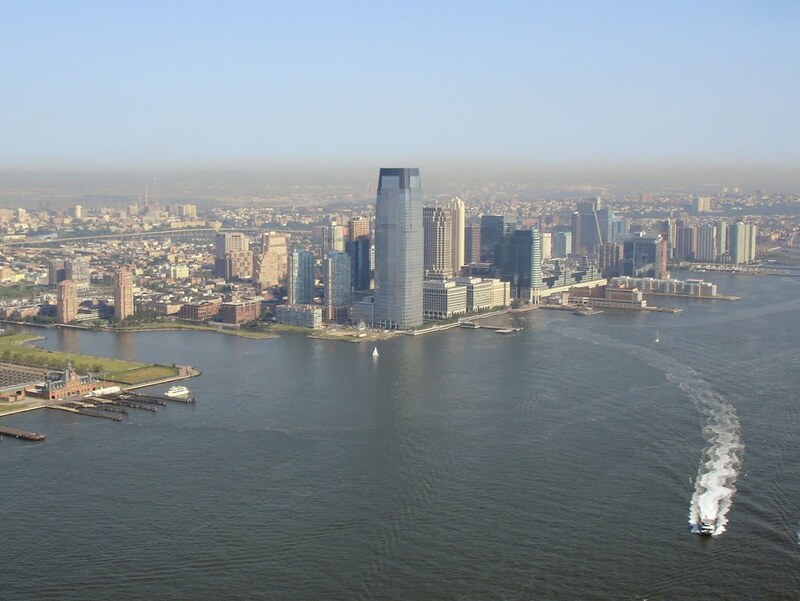 The Goldman Sachs Tower in Jersey City on the west side of the Hudson River. Beyond Lower Manhattan, the buildings dwindle in stature somewhat until Midtown, which is dominated by the Empire State Building. 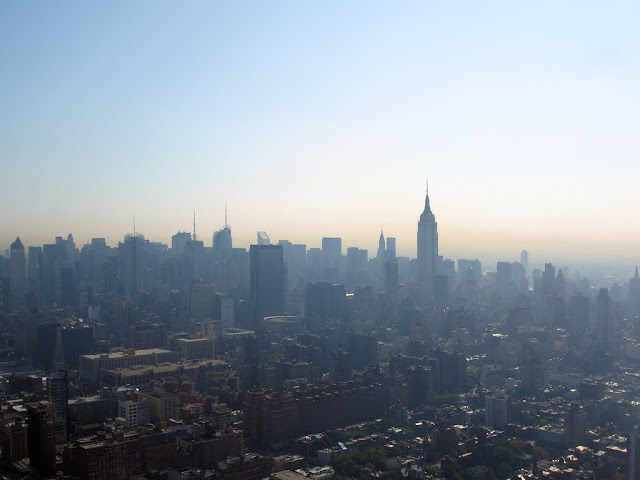 Midtown Manhattan, silhouetted in the morning haze. 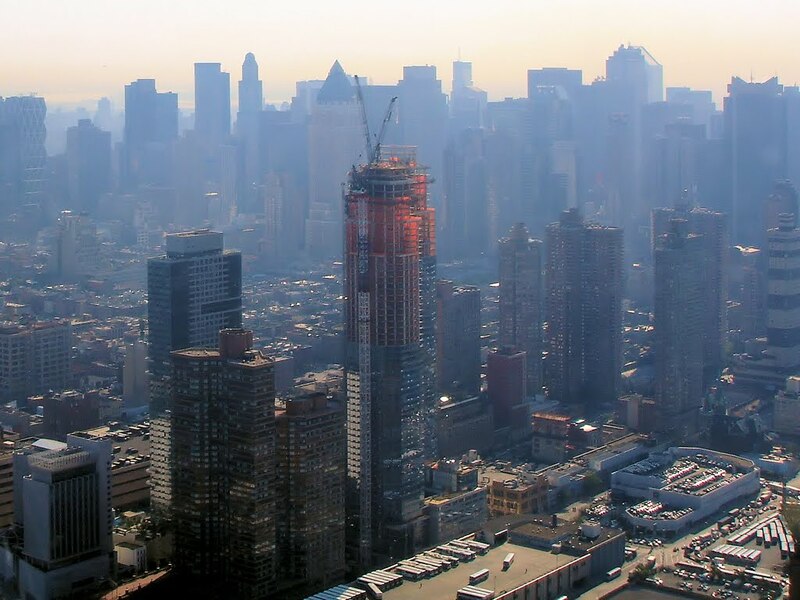 A new building reaches for the heavens. Abeam the Empire State Building. No giant apes in sight today. 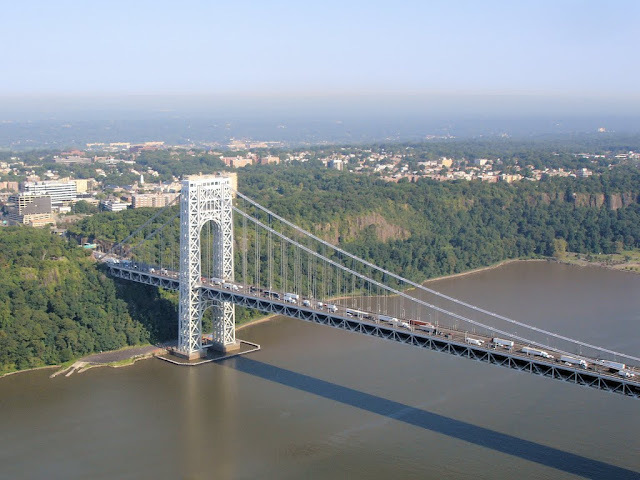 Before I knew it, I had reached the George Washington Bridge. The mightiest of New York City's skyscrapers were behind me. 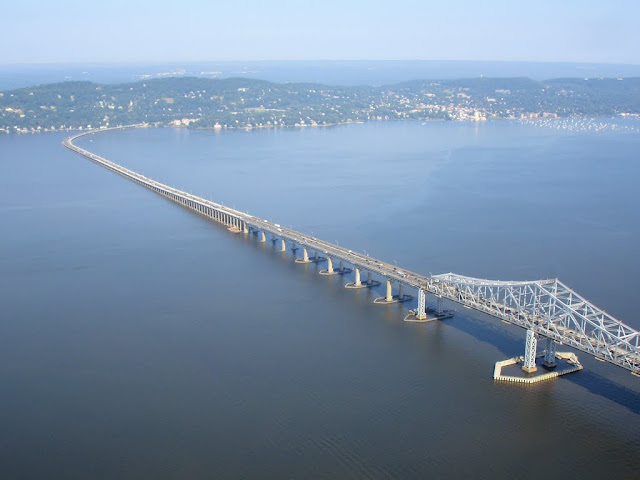 The Tappan Zee Bridge marked the end of my northward trek along the Hudson. Beyond the bridge, I climbed to 2500' and turned west toward Somerset. When I returned to Brent and Jackie's house, Kristy met me at the door to ask how it went. "Amazing" was the only thing I could think of to say. And like flying through the Rocky Mountains, the photographs are interesting enough, but cannot convey a real sense of the experience. This image was generated by exporting data from my Airmap 500 GPS into Google Earth. The blue trace shows my actual ground track through the southern portion of the Hudson River Corridor. Isn't technology great? In this case, the GPS was more of a spectator than anything else. I relied on the river and my altimeter to keep myself out of trouble. From the highway on-ramp near my house, I can look through a cut in the landscape to see the skyline of Rochester several miles distant. Every time I drive to the airport, I look toward those faraway buildings as a check for haze. The crisp outlines of the city that greeted me on August 9 were more typical of a winter day than August. With such amazing clarity, I decided that it would be a good day to get some photographs. The Le Roy airport was unusually busy that morning: two other aircraft departed the stubby runway before I did. I decided that I would make an aerial beeline from Le Roy to my house. From there, I would follow the Lake Ontario shoreline until reaching the Oswego County airport in Fulton, then return. Throughout the round trip, I ran the Warrior at 55 - 65% power settings and climbed no higher than 2500'. It was just a low and slow kind of morning. Shortly after launching from Le Roy, I crossed over these high tension wire towers marching in pairs off into the perspective. With their faces raised toward the morning sun, they shone against the green landscape. Nice days for VFR flying are also usually nice days for sailing, as evidenced by the flotilla of watercraft in the middle of Irondequoit Bay. Not long after crossing the bay, I was over my neighborhood - a sliver of new development hidden within an older section of town. From above, the street has an interesting shape; a hybrid of a music note and an integral sign. Home. The first time I took aerial photos of the house was January 2006. I had just moved in and my yard was composed of sand so fine that it actually blew under the seal of my front door during a storm. The second time was later that year while the lawn was still tenuously clinging to life a few months after it was established. Two years later, everything is quite lush (perhaps too lush, I had to mow that evening). This is an example of where I wished I had a camera with a decent zoom. When Ray first saw my camera, his comment was "you've taken all those photos with that?" He added that he expected something with a huge zoom lens on it. "No," countered Mark (N3433P). "Dave was just really that close." Looking west across Irondequoit Bay where the Bay Bridge carries NY-104 over the water. The interchange is Bay Road in Webster. This is Fort Ontario, located on the east side of the Oswego River where it joins Lake Ontario. The original fort was constructed at this site in 1755 by the British. It was destroyed a year later by the French. The second fortification at this site was destroyed by American "rebels" in 1778. The third incarnation of the fort was destroyed by the British during the War of 1812. 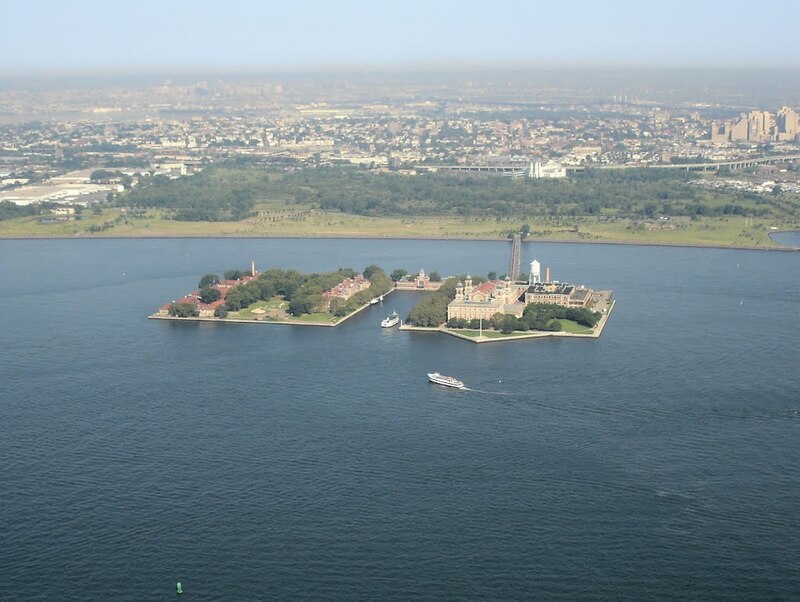 In 1844, the United States completed the pictured fort out of fears from attack by British-held Canada. It is located a few miles along the extended centerline from Runway 33 at the Oswego County airport. Yes, the history of Fort Ontario reads something like a Monty Python routine ("...so I built a third one. That burned down, fell over, then sank into the swamp"). After leaving the Oswego County airport, I climbed to 2500' and turned west. I stayed in the smooth air over Lake Ontario within gliding distance of shore. The air remained stunningly clear and the quality of light caused the shallow Lake Ontario waters near shore to assume a turquoise tint. Photographed here is Little Sodus Bay near the town of Fair Haven, NY. This is East Bay, just east of Sodus Bay. To call this a bay is something of a stretch as there is no apparent channel into Lake Ontario. When I moved to New York, I missed the sight of the sandy beach that wound along the Lake Michigan shoreline. The Lake Ontario waterfront has a very different character. Rather than a soft joining of land and water, the terrain actually appears tattered, as though the very Earth were violently ripped away to form the lake. A closer view of the shoreline reveals ordered fields producing a variety of fruit. When Kristy and I were packing our house in Michigan for the move to Rochester, one of the movers opined "I hate New York, what are you moving there for?". When we responded that it was a lot like southwest Michigan, the mover looked highly dubious. 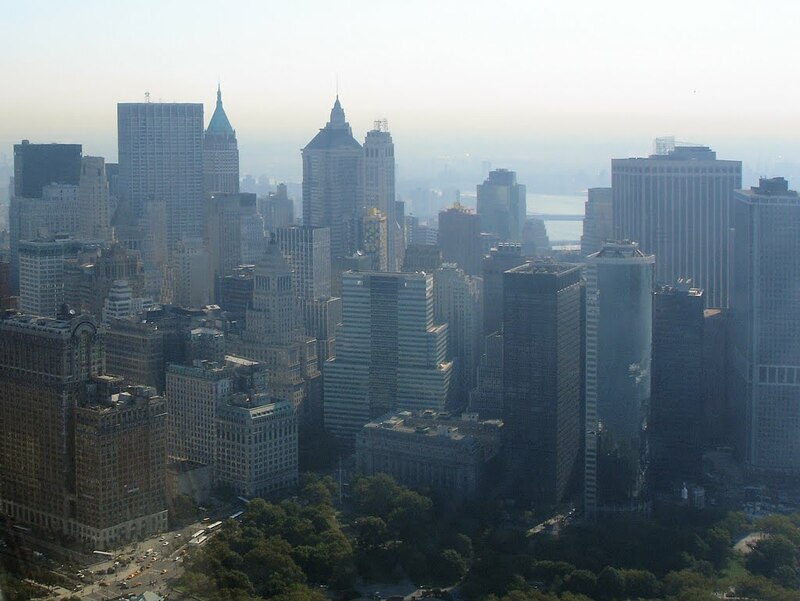 Many midwesterners seem to believe that there is nothing more to New York than the eponymous city. So I dedicate this agrarian vista along Lake Ontario to them (for the record, NYC is 300+ miles away). The day's journey ended where it began, with Irondequoit Bay. From there, a direct flight back to Le Roy would have taken me directly over downtown Rochester and Greater Rochester International Airport (visible in the photo as a large clearing in the upper right corner). I was just outside of Class Charlie airspace on flight following when the approach controller asked how much longer I planned to fly along the shoreline before turning toward Le Roy. For the moment, air traffic in the area was minimal and I was chattier than usual in my response. "Oh, I think I'll continue west past the approach path for runway 22, then turn toward Le Roy." "Sounds good to me," came the reply. Even the controller, trapped in a dark room somewhere on the field at Rochester, was in tune with the mellow vibe suffusing the air that day. Some days are just meant for low and slow.